Chicos & Indian Mangoes in Season Now! Nice shots you got there MM! you’re right, MM! Just got some of these from the supermarket. hi mr. mm! i just came from the market here in calamba and didnt notice any chicos. i wonder though if that’s what you call the chico pineras variety. is it less grainy than the native or smaller ones? i like eating chico peeled, sliced and chilled. i saw in a blog the chico prepared as an iced dessert, cubes of it with gata and pinipig. but i havent tried it yet. nice photos, by the way. Wow! You should be a food stylist! Had my fill of indian mangoes fresh from the tree when I went home last week. Meanwhile, we have a chico tree that yeilds plenty of fruit year-round, we had so much chico that we’ve gotten somewhat sick of it that my mom just gives them away. BTW, (with your permission MM) off-topic. Just an update on the dried kamias. For those to requested for it, so sorry I wasn’t able to update you all. Things were a hectic here at home the past weeks, in addition, we had problems with pldt dsl hence I can’t get online. Anyway,(naku mahaba na..) I’ve already set aside some for you Marisse and Doddie. Let me know if you still want them. I’ve also some extra – roughly 4-5 cups. Email me at g.niango[at]yahoo[dot]com if anyone is interested. great shots! 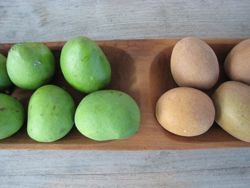 unfortunately, those 2 fruits are not available to where i am right now..
beautiful styling there, MM…that’s what some of my childhood summers were made of – mangoes, chico and endless hours playing sungka! Chicos always remind me of my maternal Lola…she had a tree that was so prolific…great way to present those fruits MM! i miss tropical fruits :) i love chico ang mangoes! Chris… you can watch the Paquiao-Hatton fight on youtube na!!! this may seem redundant but nice shots MarketMan! Millet, my childhood summers in Cebu were occasionally spent with visiting relatives from Mindanao. 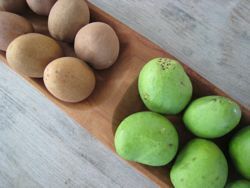 The customary indoor sungka diversion dipping Indian mangoes with salt or crunchy unripe papaya with vinegar is the sort of entertainment the computer kids of today cannot relate to. diday, OMG, unripe papaya with suka, I haven’t had that in decades! MM, the red papaya variety is better than the yellow one. were chicos. i haven’t eaten chicos for ages so i was so excited and ate quite a few of them… delicious! a friend of mine also gaveme very red and ripe macopas. she also gave me a white variety which i haven’t seen before…also equally sweet! another friend gave me really ripe and the sweetest langka segments. that was another treat that i haven’t had in a long time!!! we were like in super exclusive resort and they had a good spread of food. Here I was with my wife, just slurping on those chicos. Another time coming in from Canada, we had to eat bags of lanzones by the US/Canada border because we cannot bring it back to the U.S.
MM have you tried juani (or is it wani?) mangoes? the ones with the heady smell that indicate that they’re ripe…we have a juani season in Zamboanga but I don’t think I have seen them here in Manila. Gingerbread 2007, The Kid’s Creation!